Stargirl is quirky, peculiar, and nothing like the rest of the students at Mica High School; she plays the ukulele, she cheers for the opposing team in addition to her own, she carries a pet rat with her wherever she goes. And she falls in love with the quiet, behind-the-scenes Leo Borlock. After a sudden rise and sickening drop in popularity, Stargirl and Leo finally fall into the magic of first love. But despite Leo’s returning of her affections, he is disturbed by her strangeness and finally convinces her to do the very opposite of what makes her so special: conform. What follows is the story of one man’s lesson learned a decade too late, and the girl who taught it to him so profoundly. This book is a miracle, a warm breath of spring air packaged into a mere 186 pages. This book speaks to the soul as it artfully delves into the mystery of identity, the beauty of individuality, and most of all, the courage it takes to be different. 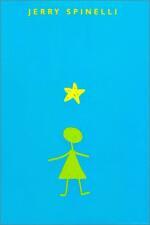 I feel like Stargirl will live on forever, her legacy waiting to touch generations today and generations to come. My heart overflowed as I read this simple but powerful story, and I had to cut off the tears more than once as I meandered through the depths that Spinelli has created with such simple language. Though categorized as a young adult novel, Stargirl is a book that all ages should read, to re-discover once again that it’s okay to be different. Good quote: “Star people are rare…I think every once in a while someone comes along who is a little more primitive than the rest of us, a little closer to our beginnings, a little more in touch with the stuff we’re made of…you’ll be lucky to meet another” (177).